Photographer, filmmaker and video artist Anton Corbijn is one of the most prolific artists of our time. He has worked with some of the biggest names in the World including Joy Division, U2, Nirvana, David Bowie, Metallica, Depeche Mode, Clint Eastwood, The Rolling Stones, and R.E.M.. Corbijn has shaped his subjects' images for many years with his unique iconography, but who is the man behind the camera and what drives him? 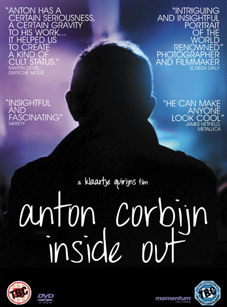 Inside Out explores Corbijn's persona, uncovering his motivation and inherent conflict as an artist, between audience's admiration and personal loneliness. Director Klaartje Quirijns uses critical and insightful interviews with artists such as Bono, George Clooney and Corbijn's family and follows the man himself, to his home, where he grew up, his studio and places of work to reveal his inspiration, his drive and his own demons. Featuring appearances from U2, Metallica, Lou Reed, Arcade Fire, Depeche Mode and an outstanding soundtrack including Joy Division, Nirvana, Depeche Mode, U2 and original music by Gavin Friday, this is a fascinating and revealing portrait of one of the most significant artists of post-modern pop culture. Variety said of the film: "This moving picture portrait of the iconic and workaholic photographer is insightful and fascinating," and if you haven't already caught it you'll get your chnce when it's released on UK DVD on 17th September 2012 by Momentum Pictures at the RRP of £12.99.